Seefeld, 14/02/2018 – The internationally recognised human rights defender and head of the National Fisheries Solidarity Movement Sri Lanka, Herman Kumara, will this year be awarded with the “TO DO Award Human Rights in Tourism“. In 2018, it is the second time already that the prize will be awarded by Studienkreis für Tourismus und Entwicklung (Institute for Tourism and Development) in cooperation with the Roundtable Human Rights in Tourism and Studiosus Reisen München. The award ceremony will take place on 8th March 2018 at 4:30 pm at ITB in Berlin. 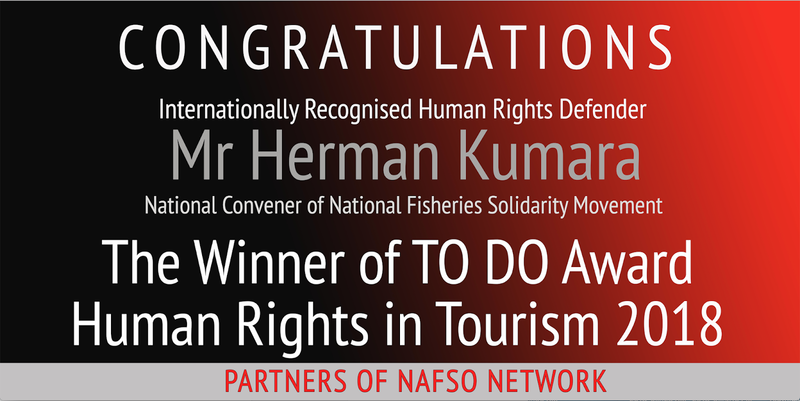 Herman Kumara has for 22 years been heading the “National Fisheries Solidarity Movement“ (NAFSO), a network of 17 fisheries organisations, trade unions and other civil society organisations in Sri Lanka. He has received several awards. The human rights defender and his organisation work for the recognition of traditional fishery and land rights, for the education and training of women and children, and for people displaced by the war. Other focus areas of his work include the protection of natural resources, peace between the various ethnic and religious groups, and a sturdy economic and social development of fishing communities. Mr. Kumara sees himself as a facilitator building bridges between ethnic and religious groups and keeps seeking dialogue with international stakeholders. “The government’s tourism strategy disregards the rights of local people and deprives them of their livelihoods“, says Herman Kumara. He put together multi-ethnic research teams, who in their conversations with affected fishermen brought to light the facts from local people’s perspectives. The people are all too often unable to cope with rapid tourism development and their existence is under threat. Mr. Kumara defines the objective of his work as “a successful coexistence in terms of a kind of tourism that benefits everyone, without human rights being violated”. After its successful premiere last year, the ”TO DO Award Human Rights in Tourism“ is going to be awarded for the second time. Upon the initiative of Studienkreis für Tourismus und Entwicklung (Institute for Tourism and Development) and in close cooperation with theRoundtable Human Rights in Tourism (an association of stakeholders from civil society, from the tourism industry and politics) criteria have been developed for this award which is to be given on an annual basis. Potential candidates for the award include initiatives, projects, and individuals who make outstanding efforts to protect and respect human rights principles along the entire touristic value chain. An expert jury will select potential award winners and then evaluate their efforts. “Especially as it is an anniversary year of human rights – 2018 marks the 70th anniversary of the Universal Declaration of Human Rights – we are glad to see that human rights have successfully been established as an issue in tourism. Understood in this way, the human rights of employees and the local population in the destinations must never be compromised“, says Claudia Mitteneder, Executive Director of Studienkreis. “Our strong partners who are with us, such as the German Commission for UNESCO, show that together we can make a difference and that we are able to sensitise tourists for this issue“. The “TO DO Award Human Rights in Tourism 2018” will be awarded on Thursday, 8th March 2018, at 4:30 pm at ITB, Palais am Funkturm. Herman Kumara will be present and will receive the prize.